Schools are investing in mass notification systems but vastly underusing them. FRAMINGHAM, Massachusetts, June 5, 2018 – Rave Mobile Safety (Rave), a trusted partner for safety software protecting millions of individuals, today revealed large gaps in campus safety after polling many of the nation’s universities and colleges. The higher education community is at a critical point in time when it comes to communicating with students, who are known as Generation Z. And currently 96% of these students own a smartphone. The Rave study, which consisted of public and private institutions of all sizes from across the country, found that only 38% of respondents offer a mobile safety app for their campus communities. While 62% of schools do not offer a mobile app for their students, things may change soon as nearly half (45%) of respondents are looking to or are in the process of implementing these offerings. Mass notification systems (MNS) help workplaces, municipalities and college campuses relay important messages to key stakeholders. However, schools are not taking full advantage of their investment into this technology. According to the survey, 57% of those polled used their MNS less than five times in a year, while 22% used it less than twice in a year. While MNS offerings are not being utilized to their full potential on most campuses, those respondents that do maximize this technology share time-sensitive information on various issues. The most common communications sent via MNS alerted higher education communities around severe weather communication (92%), active shooter emergencies (75%), class cancelations (59%), and Clery Act requirements (41%). Some of nation’s safest campuses, such as Boise State University, depend on their mass notification systems to keep both students and faculty up-to-date during campus emergencies. Higher education institutions’ top security concerns were severe weather (35%), gun violence (23%) and mental health (22%), according to the study. Speaking up around hot button topics, such as gun violence or mental health, can be very difficult for students to share with campus safety or police. In fact, previous research found only 28% of students are willing to call campus safety during an emergency. Unfortunately, Rave’s latest study uncovered not enough is being done to help students, with only 22% of schools offering the ability to submit an anonymous tip to authorities. Respondents noted gun violence and mental health were concerns, though there appears to be a disconnect. Almost 40% of respondents said their institutions had a gun incident on campus, while less than 10% are using their mass notification systems to inform students about mental health services and counseling. 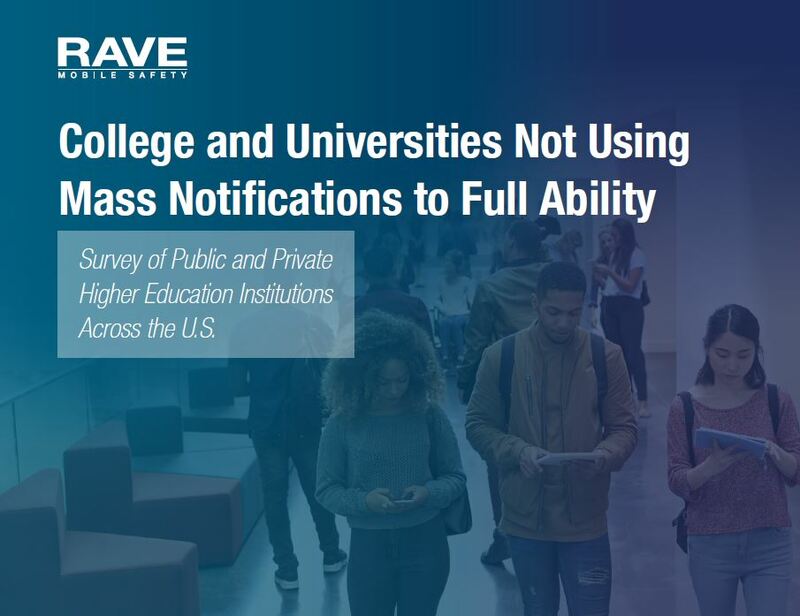 The full results of the survey and supporting data can be found in the Colleges and Universities Not Using Mass Notification Systems to Full Capability survey whitepaper. The Rave Mobile Safety blog will share the latest tips on how to take advantage of combining technology with campus safety initiatives.